The sculpture’s extensive exhibition record testifies to its success; between 1913 and 1916. Beach showed it at the Armory Show, National Academy of Design, Pennsylvania Academy of the Fine Arts, and Art Institute of Chicago. Scholars have often seen the National Academy of Design and Armory Show in opposition to one another, as representative of the old guard and new. Artists like Beach, who exhibited at both venues, suggest that the two groups were not as militantly opposed as was thought. 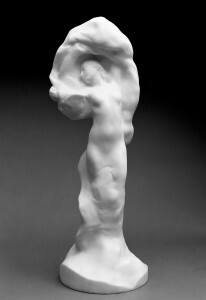 See the entry for this work in Thayer Tolles, ed., American Sculpture in The Metropolitan Museum of Art, Vol. 2, A Catalogue of Works by Artists Born between 1865 and 1885 (New York: Yale University Press, 2001), 649. Ilene Susan Fort, The Figure in American Sculpture: A Question of Modernity, exh. cat. (Los Angeles: Los Angeles County Museum of Art, 1995), 178. Virginia Mecklenburg, “Slouching Toward Modernism: American Art at the Armory Show”, in The Armory Show at 100: Modernism and Revolution, Marilyn Satin Kushner and Kimberly Orcutt, eds., exh. cat. (New York: New-York Historical Society, 2013), 251. In 1907 Beach set up his studio in New York City’s MacDougal Alley and quickly established his artistic reputation. He was elected to several organizations between 1908 and 1910, including the National Sculpture Society, the Salmagundi Club, the American Numismatic Society, and the National Academy of Design. In 1909 his sculpture Young Nymph won the Helen Foster Barnett Prize at the National Academy of Design, and between 1912 and 1917 he had six solo exhibitions at galleries in New York. Beach worked in multiple stylistic modes in the years before the Armory Show. Though he had been academically trained and experimented with the symbolist style of Auguste Rodin while in France, in New York he began making small bronzes depicting urban realist subjects. Beach’s first major commission came shortly after the Armory Show in 1915, when he designed three statues for the Panama-Pacific International Exhibition in San Francisco, for which he received a Silver Medal. David Dearinger ed., Paintings and Sculpture In The Collection of the National Academy of Design, Vol. 1 (New York: Hudson Hills Press, 2004), 29. Thayer Tolles, ed., American Sculpture in The Metropolitan Museum of Art, Vol. 2, A Catalogue of Works by Artists Born between 1865 and 1885 (New York: Yale University Press, 2001), 648.